Pictured from left to right: UIWSOM students and Laredo natives, Thomas Arthur Wright and Christian David Davila; IBC Bank Chairman and CEO Dennis E. Nixon; UIW President Dr. Thomas Evans; IBC Bank - San Antonio CEO Mike Sohn; UIW V.P. Institutional Advancement Sister Kathleen Coughlin; Commerce Bank CEO Ignacio Urrabazo; UIWSOM student and San Antonio native Leilani M. Magdaleno; UIWSOM student and Laredo native Adrian Ruperto Villarreal. San Antonio, TX -- The new president at The University of the Incarnate Word, Dr. Thomas Evans, along with International Bancshares Corporation Chairman and CEO Dennis E. Nixon, formally welcomed the newly white-coated students of the University of the Incarnate Word School of Osteopathic Medicine (UIWSOM). UIWSOM accepted a $250,000 donation from the IBC Foundation, which is administered by International Bank of Commerce (IBC Bank). Evans and Nixon spoke with students about the impact this program will have in South Texas. "The impact you will make on South Texas is immense," Nixon said. "Being in San Antonio for your education and working along physicians across South Texas is a wonderful way to serve the community. My hope is you will continue to serve our area communities long into your medical career." 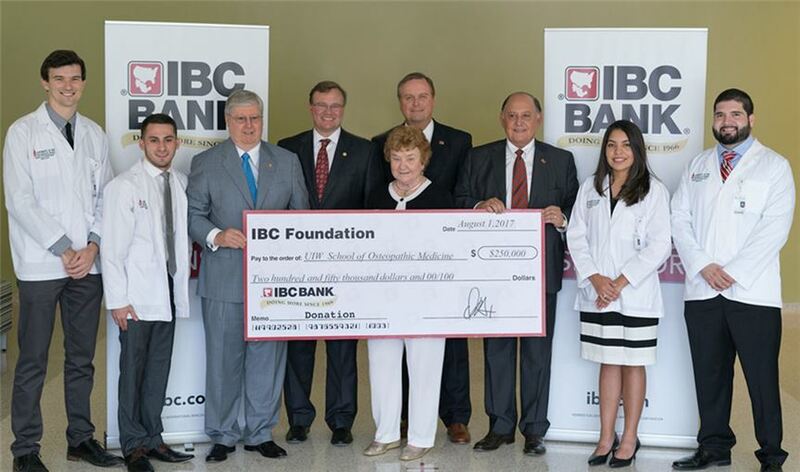 The IBC Foundation donation supports the development of UIWSOM in areas such as the clinical skills lab for first and second year medical students. Third and fourth year medical students will benefit from the newly-formed partnership with the Laredo Medical Center for clinical rotations and residency programs in family and internal medicine. UIWSOM boasts 150 students in its inaugural program, which offers doctor of osteopathic medicine (D.O. ); master in biomedical sciences; master in physician assistant studies (begins in 2020). D.O. 's practice in all medical specialties, but UIW's culture and curriculum emphasizes primary care and mental health specialties. School of Osteopathic Medicine Founding Dean Dr. Robyn Phillips-Madson said, "We are grateful to be situated in this historic and vibrant community, and look forward to working with our many partners and positively impacting the health of the people in this region now and in the years to come." The school is located at Brooks City Base, the second medical school in San Antonio and the only medical school in Texas located at a faith-based university. "The IBC Foundation is dedicated to supporting organizations and institutions that improve the communities IBC Bank serves," Nixon said. "We look forward to seeing how UIW's School of Osteopathic Medicine benefits South Texas, enriches the community in San Antonio, and improves the health and wellness of the people of South Texas."